You are here: Home » MEDIA » Books » How To Do Things: A Timeless Guide To A Simpler Life edited by William Campbell (book review). I did think before opening the covers of this book, ‘How To Do Things: A Timeless Guide To A Simpler Life’ edited by William Campbell, that it was more do with doing things for yourself. It is, to some extent, but more to do with life in the early 20th century and an American magazine ‘Farm Journal’. 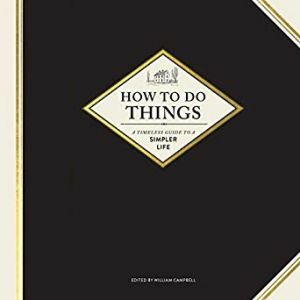 There was a lot of hints from it at the time and finally a condensed book called ‘How To Do Things’ distilled from it for their bookshelves. This is a reprint of that book. It is divided into five sections dealing with the farm although it looks more like a smallholding, the yard, the kitchen, house and workshop. It would be interesting to see how much of it is still applicable on American farms in our technological age today. Reading this book, there does appear to be some useful advice and hints that, although looking straightforward to someone like me, might not be known to those new to farming. There’s a vast selection of games that you can arrange to play with your kids in this time period. The few that devote themselves to word games did make me wonder about the literacy of the period and how did the less smart kids cope with them. In that respect, you tend to learn more about the education of the people at the ‘Farm Journal’ than whether they were played or not. Interestingly, although Halloween is covered, there is no reference to ‘Trick Or Treat’. The Journal started in 1919 and ‘Trick Or Treat’ didn’t really hit the USA until 1920 so probably didn’t percolate through the states thoroughly for a couple years, although you can see how dressing up from the games notes here were added to it. The final section of the book focuses on making things in the workshop, some of which are there to ensure animal safety, like preventing sows from crushing their off-spring when they lay down. Oddly, there was nothing on irrigation. In many respects, this is an odd book for today but if you’re choosing this time period for a story, then it might give you some ideas as what went on back in those days. « Avengers: Endgame (Do you trust me? Trailer).